Discussion in 'Designers and Collections' started by Flashbang, Sep 27, 2009. ^Those thights are horrible, and I don't like the orange pieces, but nice collection. 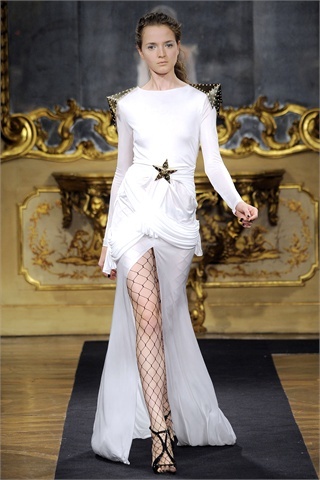 With sheer and mesh in for spring this was bound to be Scognamiglio's season; his trademark piece being the sheer blouse. I adore the jacket and dress with the metal pointed shoulders also, look number two is gorgeous - a whalenet-under-black-sheer-silk jumpsuit - it's beautiful. If you think about the main theme, you can see that the entire collection is about stars - the pointed shoulders being the top points of a five pointed star, the legs and head being the other three. 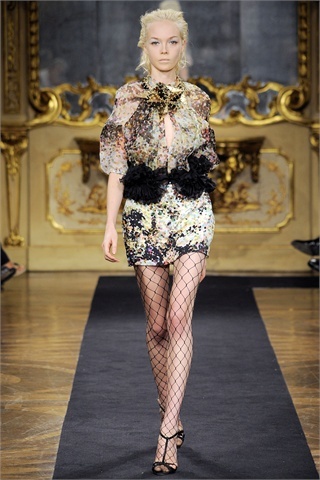 I've never seen Scognamiglio use colourful print before.. I'm intrigued to see what it's like. I also love how this dress looks like a destroyed version of this dress. Though the latter looking more Donna Karan than Francesco Scognamiglio.. and the former verging on Givenchy.. The orange lined coat is gorgeous, with that relaxed luxury feeling from the twenties. I can't wait to see this collection in motion. 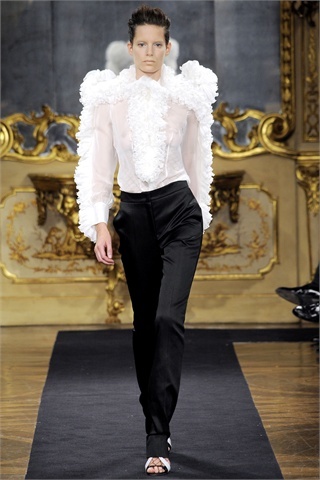 ^ Francesco Scognamiglio did those ruffle blouses last season also... it's his trademark.. He did? Ok then. But someone has been copying someone. was at the show..beautiful collection..especially the backs of some jackets are like seethrough organza corsets! You were? Any pictures or videos? I love him. He can do no wrong! 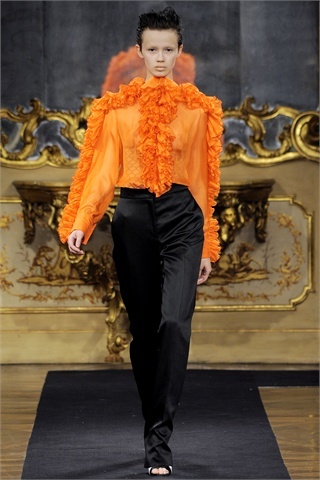 And yes, the ruffle blouses are his trademark. I think Madonna wore one. The last two dresses in post #3 look they came from Marios Schwab's f/w 09 collection. omg that's right it looks givenchy TOO much!!!! what a shame !! 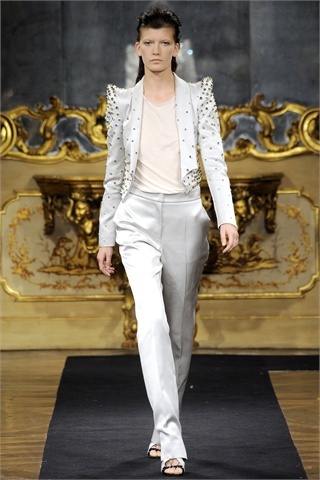 but the collection is very nice, there isn't a lot of designer who have a "couture style" there.